To accomplish these goals, we employ a variety of materials and methods (stories, documents, personal accounts, etc.) 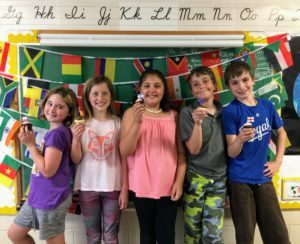 As the students move from one grade to the next, they continue to build a historical and geographical framework for their understanding of social studies. 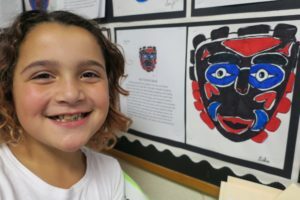 Kindergarten social studies focuses on creating an understanding of community and each student’s participation in an expanding circle of communities, such as family, their class of peers, the school community, and the neighborhood, specifically the West Seattle area. This curriculum emphasizes building oral-speaking skills, incorporating investigating, recording, dramatic play, and reporting in both written and oral components. Community is also the underlying theme of the first-grade social studies curriculum. As members of their classroom community, students participate in experiences which develop group social skills, enhance peer relationships, and promote individual responsibility. The curriculum is designed to foster understanding and appreciation of diversity in our families, school, and other cultures. Through a variety of activities, students recognize that they are a part of several communities, and the larger community of mankind. Several events in American history are studied and integrated throughout the curriculum. Diversity is explored through family observances, holiday celebrations, and cultural events in the Seattle area. 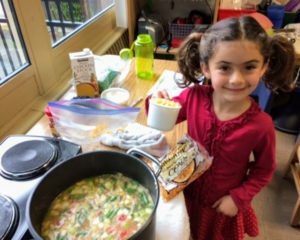 In partnership with other classrooms in the school, first-grade students help plan and implement at least one community service project during the school year. United States Geography: The second-graders crisscross our country from the Appalachian Mountains to the Rockies, from the Mississippi River to the Sonoran Desert, studying the physical features, culture, plants, and animals that make these places unique. Along the way, we continually reinforce the cardinal directions, so that students are aware of where we are, both within our country and relative to the other landforms we have studied. The students are also gaining an understanding of the distinction between city, state, and country through our studies of the real world. To enhance their map skills, the students complete the workbook Maps, Charts, Graphs: Neighborhoods. It teaches skills such as understanding cardinal directions, the use of map keys and symbols, scale, and graphing. We begin in about 1850, and end in West Seattle at the Luna Park amusement park, around the turn of the century. For much of the school year, we look at Seattle’s early days through the eyes of Louisa Denny, the seven-year-old child of pioneers Arthur and Mary Denny, and Caya, an imaginary 10-year-old Duwamish Native American boy. 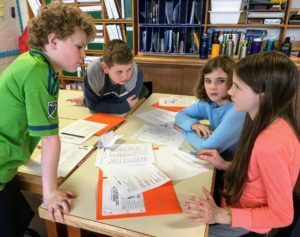 As they learn the important stories in Seattle’s early history, students follow along on maps and write journal entries, retelling, illustrating, and re-enacting the stories. They also look at parts of their own families’ histories, and do simple art projects to enhance their understanding. 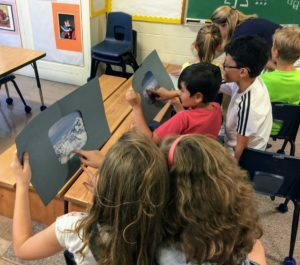 World Geography: Here the third-graders learn about some of the major mountain ranges, rivers, deserts, and rain forests of the world. We begin our study in Asia, with the Himalayan Mountains and the Gobi Desert. Next, we move to Africa, learning about the Sahara Desert. From there we travel to South America to study the Amazon River and rain forest. We finish the year with a Geography Bee, in which the students learn the continental location of 100 countries around the world. Along the way, we have reinforced basic geography concepts, such as the hemispheres, equator, prime meridian, and names and locations of continents and major oceans. To continue to cement their map-reading skills, the students complete the workbook Maps, Charts, Graphs: Communities. 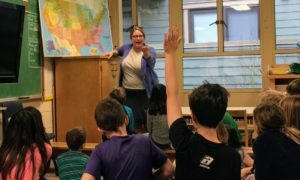 Washington State History: Third-graders expand their horizons from the focus on Seattle history in second grade, by going back to an earlier time when Washington State was not yet a part of the United States. The goal is for the students to understand the way in which the Pacific Northwest evolved and became a part of our country. The course begins with the European explorers of the Pacific Coast in the 18th century, proceeds through the overland expedition of Lewis and Clark, continues to the trading forts and fur companies, and culminates in statehood in 1889. 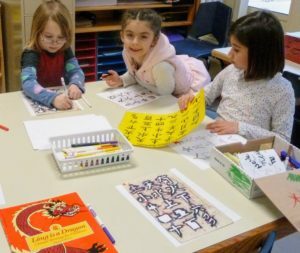 As they learn these early stories, students use and make maps, re-enact stories, write journals, think about their own family origins, and complete simple art projects to enhance their understanding. 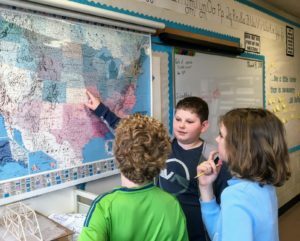 Washington State Geography: Fourth-graders apply map skills to the study of Washington’s geography. Students learn about Washington’s regions, land-forms, rivers, climate, and economics. US History: History is presented as a series of rich and interesting stories about the people and events that shaped our country. 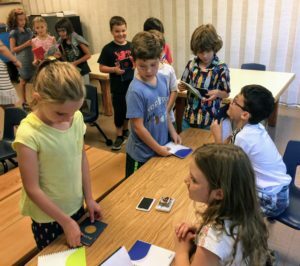 T-he fourth-graders investigate the early days of our country, from the land’s earliest inhabitants, to European exploration and colonization, to independence and the formation of our nation. 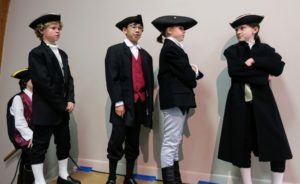 All of this culminates in the presentation of a play based on some aspect of the American Revolution. U.S. Geography: Students learn to map U.S. states, major bodies of water, and major land features. Geography concepts studied include latitude & longitude, time zones, tropical zones, the International Date Line, the Prime Meridian, the Arctic & Antarctic Circles, and more. U.S. History: The program continues the fourth-grade timeline, starting with the U.S. Constitution. We study major events and concepts chronologically, exploring various perspectives and emotional responses through readers theater, poetry, historical fiction, documentaries, letters, memoirs, simulations, art, and more. Environmental Education: Students learn how we positively and negatively affect our fragile planet. Through hands-on science lessons, community service, the IslandWood School Overnight Program, and nutrition lessons, students learn the powerful role they play in shaping a sustainable future.